On 20 March 1478 Elizabeth Woodville, Queen Consort of Edward IV, granted the manor of Great Haseley in Oxfordshire to the College of St George, together with the manors of Bassetsbury and Long Crendon in Buckinghamshire and Pyrton in Oxfordshire, and the fee farm of the town of High Wycombe. The deed of conveyance is held in the St George’s Chapel Archives (SGC X.4.23). 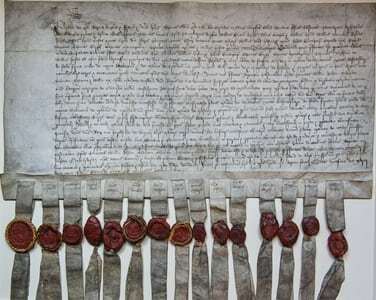 It is a fascinating document with fifteen wax seals appended, those of the Queen, the Chancellor and thirteen other courtiers in descending order of rank, many encircled with straw plaits to prevent damage, and is one of the few medieval documents in the Chapel Archives sealed by a woman. The sign manual of Edward IV (‘ER’) appears on the top left-hand corner authorising the grant. The manor brought with it a significant income to assist in funding the construction and maintenance of the new St George’s Chapel at Windsor where Elizabeth and her royal husband were to be buried. In acquiring the manor, the Dean and Canons took over not only the responsibility for raising rental income but also the management of the estate until it was sequestered by the Ecclesiastical Commissioners in 1867. Amongst the treasures held in the Chapel Archives is a volume of Great Haseley estate maps, surveyed and drawn in ink by William Burgess in 1729 (SGC CC 11232). Wrapped in a vellum cover, it contains five hand-coloured plans, beautifully illustrated with borders and cartouches, which cover different areas of the village – east, south-east, north-east, north and south-west. They are a delight to behold and demonstrate the artistic skills of the surveyor as well as his meticulous measurements. The final double page includes a written table entitled ‘The particulars of Great Hasely in the County of Oxon’ which lists the occupiers of the land, both freeholders and copyholders, and analyses their holdings. The map shown here covers the south-west of the village, delineating field boundaries, identifying individual strips of arable in the open fields with their owners and acreage, and providing coloured elevations of individual buildings, including the church, manor house and tithe barn on the top-left of the plan which are lovingly portrayed by the artist. Each close and meadow is carefully drawn and the pictorial representations of the smaller houses, with hedged gardens, trees and out-houses, provide a good impression of the layout of Great Haseley in the first-half of the eighteenth century. 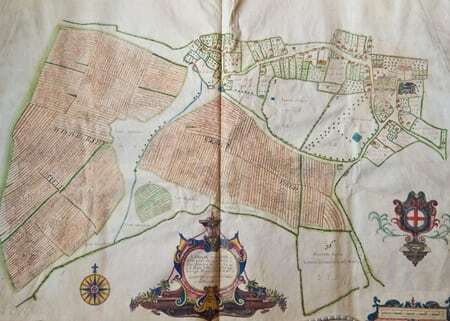 Local historians have found the maps invaluable in tracing the history of the village and dating some of its buildings, whilst the accompanying tables provide a wealth of information for the economic and agricultural historian. We learn for example that of the 588 acres of land in Great Haseley, 215 acres are made up of open fields divided into strips farmed by nineteen named tenants, with the remainder enclosed by nine individual farmers as arable land (over 173 acres) pasture (over 149 acres), meadow (over 39 acres) and woodland (2 acres). Of the forty-nine cottagers named in a further table, seven are widows and one, William Hinton, holds a vineyard. This pattern of landholding probably continued until the early nineteenth century when a Private Enclosure Act, passed in 1820 and implemented two years later, led to the enclosure and reallocation of the remaining open fields.